Tesla, Inc. TSLA will initiate electric car production at its upcoming Shanghai, China-based plant from the second half of 2019, per Bloomberg. The information was shared by the Shanghai government. Apart from constructing the hub, the company has to ship and set up its production lines at the newly constructed plant. Lately, the mayor of Shanghai visited the factory site and encouraged Tesla to commence the factory construction. Known as Gigafactory 3, Tesla’s first-ever plant outside the United States requires massive investment. High costs to construct the site pushed the company to borrow funds from a few banks in China. Per RBC Capital Markets analyst, Tesla might borrow approximately $1.3 billion from the local banks to pursue its facility development. Huge prospects for battery-powered, plug-in hybrid and fuel-cell vehicles make China a lucrative market for automakers that offer new-energy cars. Per China Association of Automobile Manufacturers, the industry is expected to sell 1 million of such cars this year compared with 777,000 units sold in 2017. Further, China set a target to sell 7 million such vehicles per year by 2025. However, an import tariff of 40% on vehicles imported from the United States places Tesla in a disadvantageous position against the local players. In China, the company’s sales plunged 70% year over year in October as it sold only 211 vehicles. After the United States, China is the second-biggest market for Tesla. In 2017, increased demand for Model X aided the company to two-fold its annual sales in China to over $2 billion, per Electrek. However, Tesla’s dependence on imports at times of high import taxes positions it in a difficult spot. In a bid to avoid steep tariff charges and production costs, and set affordable pricing, Tesla has to start producing vehicles in China itself. In third-quarter 2018, revenues and net income of Tesla gained year over year. For fourth-quarter 2018, it anticipates production and deliveries of Model 3 to increase sequentially. Additionally, the company expects to deliver 100,000 Model S and X vehicles in 2018. Over the past three months, Tesla’s stock has gained 37.9%, outperforming 9.7% increase recorded by the industry it belongs to. 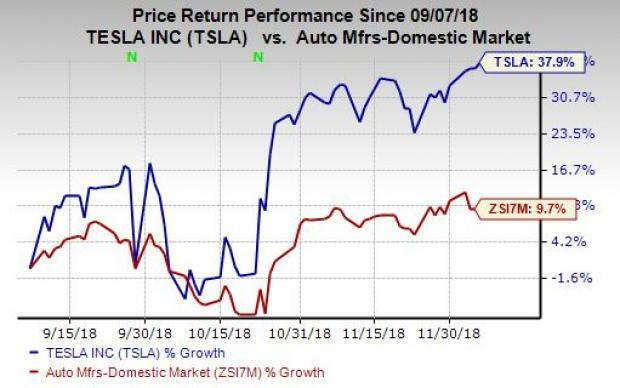 Tesla currently carries a Zacks Rank #1 (Strong Buy). A few other top-ranked stocks in the auto space are CarGurus, Inc. CARG, Cooper Tire & Rubber Company CTB, and General Motors Company GM, each carrying a Zacks Rank #2 (Buy). You can see the complete list of today’s Zacks #1 Rank stocks here. CarGurus has an expected long-term growth rate of 5%. Shares of the company have increased 7% over the past six months. Cooper Tire has an expected long-term growth rate of 4%. Shares of the company have rallied 5.8% over the past three months. General Motors has an expected long-term growth rate of 8.5%. Over the past three months, shares of the company have gained 5.3%.